You have to separate DCC which is a signalling protocol derived from the original Motorola alarm system protocol and how it is powered. DCC is not a stopgap for something better, how it is powered may be. We all bought RELCO 40 years ago and we all now use digital DC controllers, so power supply reliability will move forward. With DCC super caps are the answer and they are getting cheaper and smaller. Some of the latest I have seen in the lab will power a loco for over 30 seconds. As for cleaning tracks, dirty tracks leave deposits on coach and other wheels and cause them to run badly so you still have to clean tracks. Maybe, but that's why the DJM's next project will be a working Railgrinder! Don't joke someone might try to make one and destroy their track. LGB do one and it leaves distressed and pitted track - fastest way to spark erode your loco wheels. Track Magic and a cotton mop to apply it is much better. If you must sand - ladies nail buffer blocks will clean and polish rails (as well as nails). I don’t want to shift the focus away from the original purpose of this topic, which was to plot the progress of my train shed project. However, considering that no more progress can be made until the train shed is installed later in September ,an aside about control and power systems might be useful here. Of course DCC is not the final solution. Whatever system we use, if we are using track-based electric power, it is essential that the track be kept clean. Certainly DCC does not offer a simulation of proper cab control. 30 years ago I built an N-gauge layout using DC (there was no alternative) and designed, built and operated an inertial controller. This was based using digital electronics to control the locos. For those in the know, it was based around 7400 series TTL technology (apologies for the jargon) and provided a pulse width modulation output, similar to that provided by a DCC decoder. There was a rotary control that represented the regulator valve, a horizontal slider that simulated the steam cut off function (right for forward left for reverse and central for zero motion of the piston valve) and a vertical slider for the brake. Opening the regulator and increasing the steam cut off percentage allowed a speed reservoir to fill, while the brake bled speed for the speed reservoir. The speed reservoir itself controlled the mark to space ratio of the full amplitude square wave to the track. With everything shut off, the speed reservoir would gradually empty, representing the effect of coasting. The only side effect was a high pitched hum from the electric motor. The only problem was that it only controlled one locomotive and had to be switched between sections and points all had to be controlled separately, just like an ordinary DC layout. What DCC does, and this is what appealed to me, is allow several locomotives to be controlled from a single walkaround (hand-held controller) together with the points, signals and anything else that needs to be controlled. It also allows routes to be set up so that several points can be set to allow a train to move from an initial location to its final destination with a single setting of the controls. In addition, it allows each locomotive to be programmed with a maximum speed and acceleration and deceleration rates. So, if anyone could come up with a tiny Li -ion battery that would fit into a pannier tank and run continuously for the three hours of my timetable and develop a control system that would allow it to be operated from a single walkaround that controls all the trains and everything else, then that would be great. Once the train shed has been installed, I will begin to send photos, both of the empty shell and as I begin to assemble the baseboards, fit the electrics and lay the track. In the meantime, I have planned these activities and I will describe the plan here. For reference, I have included the layout plan. The board outlines are shown in red and the cross-members in green. There will be 9 baseboards altogether and I have labelled them on the diagram. 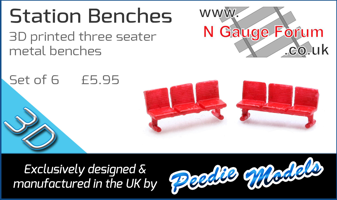 I am buying all the baseboards as kits from Model Railway Solutions. The first task, prior to assembly of the base boards will be to drill the adjacent frame sections to fit the alignment dowels and connecting bolts. The order of drilling is LF to FF, FF to RF, LL to LF, LB to LL, CL to LB, RR to RF, RB to RR and CR to RB. As each pair of adjacent frame sections is drilled, the dowels will be inserted ready for joining. Once all the drilling is complete, the frames will be assembled, but the 9mm ply boards will not be fitted until later. Next the bottom of boards LF, RF, CL and CR will be marked to allow the accessory decoders to be fitted clear of the frame cross-members. Then the tops of boards LF, FF, RF, LB, CL, RB and CR will be marked to ensure the points can be fitted with the point motors clear of the frame cross-members. Following this, the braced leg sets will be attached to LF (2 pairs), RF (2 pairs), LB (1 pair at left end), CL (2 pairs), RB (1 pair at right end) and CR (2 pairs). Finally the boards will be joined together as shown in the diagram, with each join held in place by a pair of M10 bolts with wing nuts (for easy dismantling if necessary). Next the DCC wiring will be added to each frame. For each board, a double busbar for the DCC (one for each polarity) will run from one end to the other. Each busbar will consist of 16swg bare TCW (tinned copper wire) stretched between solder tags at each end of the board. Connection between boards will be via twin plug and sockets. This will supply the tracks and the control signals to the auxiliary decoders. 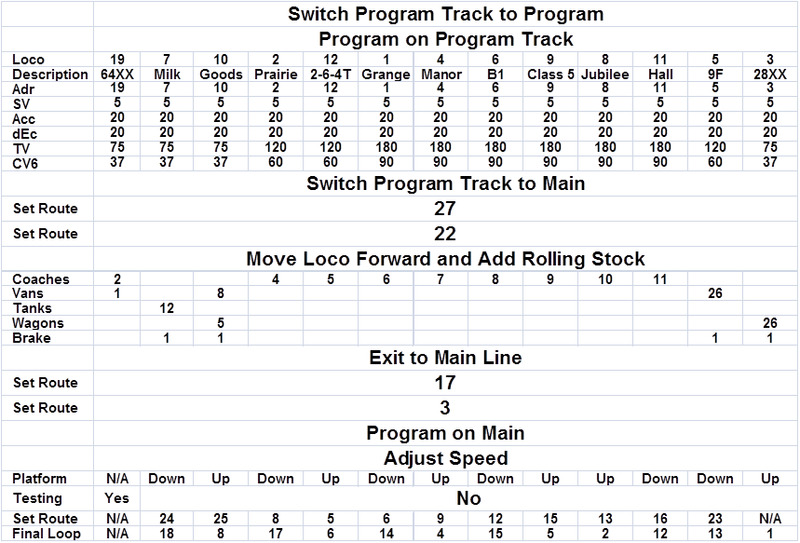 The program track will be the tail shunt to the milk depot and it will be connected via a DPDT (double pole double throw) switch so that the program track can be connected to the program output during programming and to the main for normal operations. The auxiliary supply to the accessory decoders will be a twin core, daisy-chained to the three decoders in each half of the layout. Once the basic wiring has been completed, the accessory decoders will be attached to the underside of the 9-ply boards and the boards will be positioned on the frames, with temporary fixings if necessary. At this stage the track routes will be marked out and the cork underlay fixed to the boards. The next task will be to make a template for the Seep PM1 point motors and then, for each point motor, the holes will be drilled and the motor attached. Once all the points have been installed, the rest of the track will be laid and the track wired into the DCC supply. I will probably use Peco power feed joiners as this will reduced the amount of soldering directly to the rails. The points frogs will be connected via the PM1 change-over switch, fed from the DCC bus. At this stage, all the point motors will be connected to the accessory decoders. The next task is to install a sub-baseboard table to house the DCC controller, the auxiliary power supply and the DPST for the program track. The DCC from the controller will be connected to the DCC bus at this stage and the accessory controllers programmed. All points will be checked manually before screwing down the boards and programming the routes. A physical check will be made on all routes before commissioning and testing. Thank you, Laurence, for that very detailed explanation. 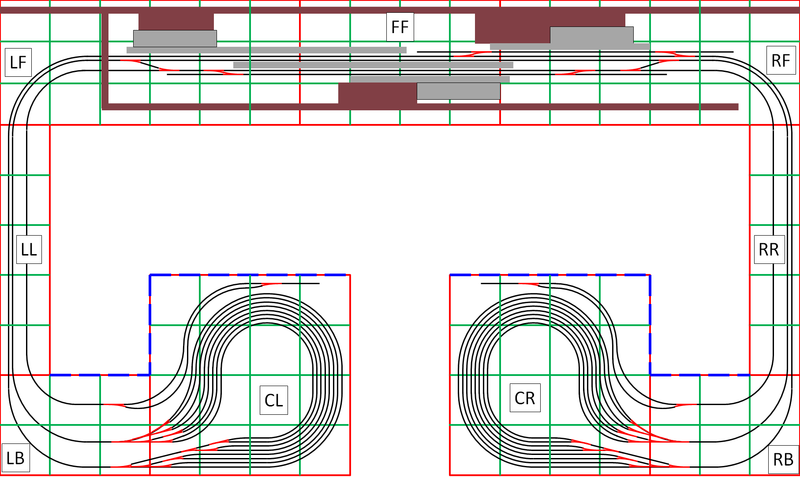 If I ever have a more complicated DCC layout, I will know where to go for detailed instructions. You're very well-organised so I'm sure all will go to plan. I look forward to watching your layout develop. So what will you be doing next week then, Laurence? If only it were that simple! The Train Shed will be installed in four weeks time. I won’t order the baseboards until the shed is up because, although the layout and the shed are designed to fit, I want to be certain of everything before I actually place the order. I’m that sort of person. There’s about a five week lead time on the baseboards, but I can have all the electrical stuff ready for when they arrive. So it will be an over-Winter project. At least I’ll have less to do in the garden, although there’s still some infrastructure work for us to complete. I usually get all the digging up roots, shovelling and barrowing jobs. But the fruit and vegetable beds will not require much attention. All that will be left to harvest by then are the carrots, parsnips and cabbages. I also have a plan for commissioning and testing, but more of that later, if you can stay awake. Commissioning and testing may not take place until the spring. However, during the construction phase, I hope to be able to post plenty of pictures and anecdotes about my experience of building the layout. But when the layout is complete, I will need to start commissioning the locos and testing the routes. I have drawn up a commissioning sheet which shows the order of commissioning and the procedure for each loco. The locos will be commissioned in the order shown, from left to right. Loco 3 is last because Loco 3 is the default address that all the locos will have on delivery. Because the second part of the commissioning is carried out by programming from the main output, it is important to ensure that there is only one Loco 3 on the layout at any time. I begin with Loco 19, because it hauls the branch train so it can be used to test the whole of the main line and then the branch, including the run-arounds. The first stage for each loco is to change over the DPDT switch to the program track to connect it to the program output of the DCC controller. The first part of the commissioning is then carried out on the program track. The loco programming consists of setting the configuration variables (CVs) as defined by the NMRA. First, the loco ID (CV1) is programmed as its address. Then the start voltage (CV2) is entered. The available voltages to enter as CVs are 1 to 255, with 255 representing the full rectified voltage. 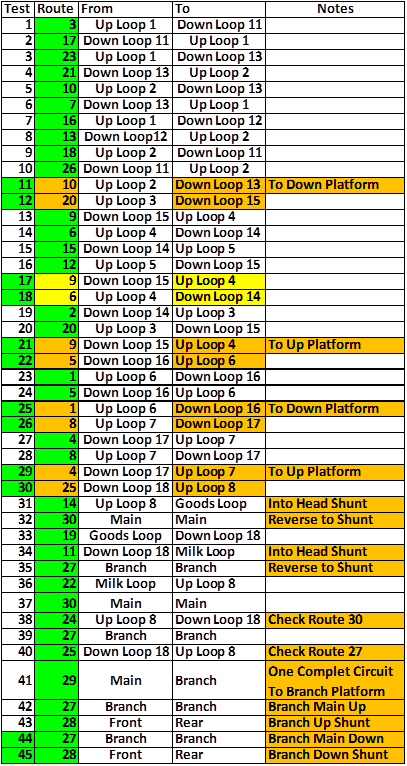 So with 28 steps (the default for the Loco decoders) CV1 needs to be about 1/28 of the top voltage, TV (CV5). I’ve actually chosen 5 for every loco. Acc (CV3) is the acceleration time and is approximately the time from rest to top speed in seconds. Likewise dEc (CV4) is the deceleration time. TV (CV5) is the voltage required for the top speed of the loco. I won’t know until I do the second part of the commissioning what the correct value is for each train, because it partly depends on the load (number of coaches, wagons, etc). CV6 is the mid voltage and may not be required if the decoder has a linear response. After the first part of commissioning, the program track is connected to the main output via the DPDT. The routes are set to allow the loco to move forward and the rolling stock are added. Once the train has exited onto the main line, routes are set for the calibration phase. In this case, the time is measure for a complete circuit at full speed. For 60mph the time should be 150s, 50mph 180s, 40mph 225s and 25mph 360s. After two or three circuits, CV5 can be adjusted if necessary and the time checked again. Once the top speed has been verified, the routes can be set to park the train in its allocated starting loop. However, in the case of Loco 19, the first to be commissioned, it is used to test all the routes before commissioning continues. The tests are shown below. All the mainline routes will be tested in turn. After that, the branch access will be tested followed by the branch run-arounds. The branch train will then be parked in its starting position for the timetable. However, it may not be plain sailing, which is why the testing and commissioning is important. I’m getting quite excited. In four weeks time the train shed will be ready for occupation. Four weeks tomorrow we’ll be having a train shed warming and then it’s down to hard graft. I’ve already made my first purchase. 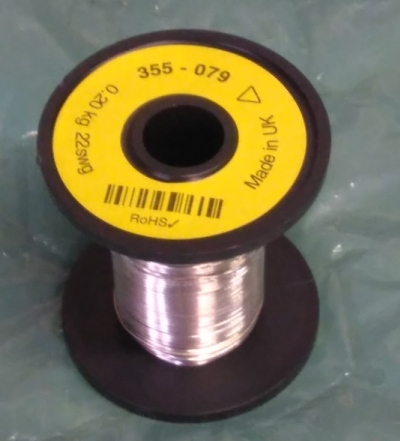 OK, it’s only a real of tinned copper wire, but you have to start somewhere. I’ve taken a picture of it to help build the excitement. This time next week the train shed should be installed and I can order the baseboards. We're planning a train shed warming party next Saturday and I'll post some pics of the shed as it progresses. There's been a slight hitch. I received an Email saying the electrician from the supply company wanted to come on Monday October 3rd to connect all the electrics. I told them that it all needed to be finished before Saturday. The result is a compromise. The electrician is coming on Friday, so, hopefully, all's well the ends well.